These miniature duck bites will be the talk of your party. *Prawn crackers are available in Asian food stores (Vietnamese Sa Giang brand is recommended), or use chilled lettuce cups. Heat oil, two centimetres deep, in a small, deep frying pan. When hot, add prawn crackers one or two at a time. Remove and drain as soon as they puff up fully. Continue until you have 20curved crackers that can hold filling. Cool and store in an airtight container. Heat water or stock in a wok or frying pan. When simmering, add duck, eschalots, chilli, one tablespoon fish sauce, sugar and salt and cook, breaking up meat with a wooden paddle or spoon, for three minutes or until cooked. Remove from heat and drain juices. Toss duck with lime juice, sweet chilli sauce, remaining fish sauce, mint and basil leaves. 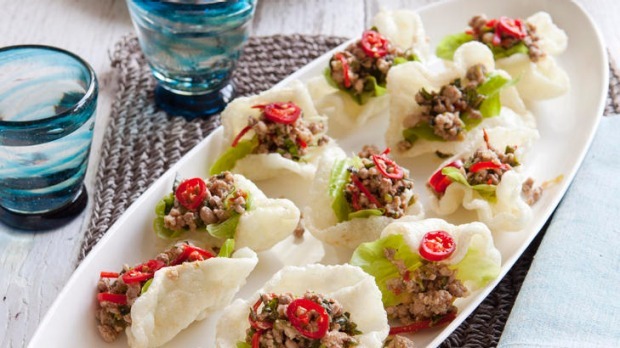 To serve, tear lettuce leaves into small pieces and use to line inside each prawn cracker, to help keep them crisp. Using a slotted spoon, top with duck mixture and serve immediately.